Access for 1 (one) to the annual Morristown Halloween Pub Crawl on Saturday October 26. It's nearly here Morristown one of the biggest and most anticipated parties of the year, and we're not talking about New Year's Eve. Halloween has to be one of the most long awaited parties, simply because it's the only holiday in the year where we can dress up like fools and visit our favorite bars. This year is going to be a little extra special for you as PubCrawls.com is putting together the biggest organized pub crawl that Morristown has seen in years. Get ready to visit some of the best bars that Morristown has to offer, all in one day, while enjoying some insanely good drink specials! For months before October, everyone's already anticipating Halloween night. We start planning our costumes early on, but too often we forget to focus on what's really of important; the party! 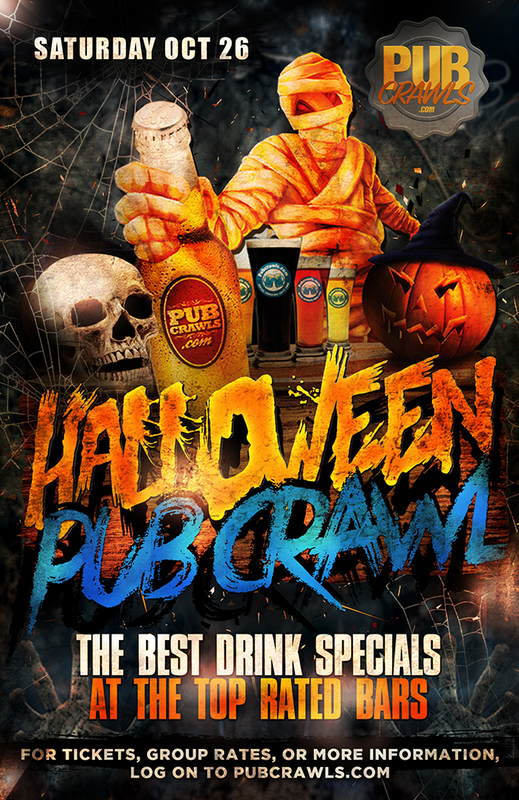 This year, don't worry about having to stick to one bar in Morristown, as PubCrawls.com is producing the biggest Halloween pub crawl in town! Featuring some of the top bars in the city filled with costumed guests enjoying drink specials, this is one experience you won't forget. Let the inner goblin in you come out to play on the wildest party night of the year. Be sure to get your tickets while you still can. Prices will increase as we get closer to HalloWeekend. Producing fun, safe, and social drink environments for over a decade - including top nightlife holiday events such as Halloween, Cinco de Mayo, St. Patrick's Day, New Year's Eve and countless others. Explore the hundreds of annual events organized every year!